It seems I've spent a lifetime of painting furiously, changing styles/techniques a couple times along the way, to get where I am at today. And for all that work it's a good thing that I really did enjoy the journey. It all seems to be coming together with new galleries representing my work and a full schedule of exhibition shows plus the chance to finally 'retire' from art festivals. It doesn't mean that I can't stop working hard, though - the momentum needs to be continued in order to flourish-and that isn't usually a problem with me because I LOVE spending my days in the studio! Upcoming shows: "Lost and Found" a 3 person show featuring my mixed media paintings at the CVA in Wausau - this show's opening reception is next Friday from 5-7 pm. Opening in May is a solo show at the Wild Apple Gallery in Neenah featuring my new oil/cold wax paintings based on abstract landscapes. Then this fall I have a show on my new oil/cold wax paintings at Bindley Collections in Middleton, Wisconsin. Meanwhile I will just keep painting! 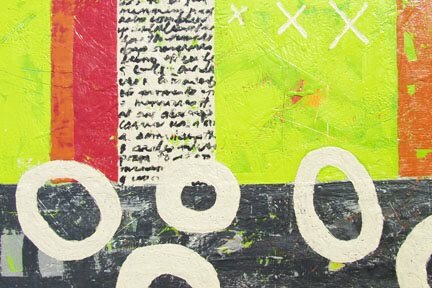 The image posted here "Running in Circles" is an encaustic painting which was just accepted into a national juried show sponsored by the "International Society of Experimental Artists". That show features 100 paintings from artists around the world and is being held at GDP Gallery in Shelton, WA.